We are pleased to announce the Featured Journal of this Month—Nutrients. Nutrients (ISSN 2072-6643; CODEN: NUTRHU) is an open-access journal of human nutrition published monthly online by MDPI, in collaboration with The Nutrition Society of New Zealand, Australasian Section—American Oil Chemists Society (AAOCS), and Asia Pacific Nutrigenomics Nutrigenetics Organisation (APNNO). Since it was founded in 2009, Nutrients adheres to rigorous peer-review and editorial processes and publishes only high-quality manuscripts that address important issues related to the impacts of nutrients on human health. Currently ranked in the first quartile of journals publishing in the field of nutrition and dietetics research, Nutrients has an Impact Factor of 3.55, and the five-year impact factor is 4.187. The scope of Nutrients includes macro- and micronutrients; essential and bioactive nutrients; human nutrient requirements; human nutrition aspects of plant, animal and marine; nutrient sources functional foods; supplements; nutraceuticals; dietary intervention trials; health claims; diet-related disorders. For more information, also check out our special issues currently open for submission. In the following, we present a selection of recently published papers that highlight the latest research in the field of nutrition and dietetics. Epidemiological studies have shown that vegetable consumption is inversely related to the risk of cardiovascular diseases. Moreover, research has indicated that many vegetables like potatoes, soybeans, sesame, tomatoes, dioscorea, onions, celery, broccoli, lettuce and asparagus showed great potential in preventing and treating cardiovascular diseases, and vitamins, essential elements, dietary fibers, botanic proteins and phytochemicals were bioactive components. The cardioprotective effects of vegetables might involve antioxidation; anti-inflammation; anti-platelet; regulating blood pressure, blood glucose, and lipid profile; attenuating myocardial damage; and modulating relevant enzyme activities, gene expression, and signaling pathways as well as some other biomarkers associated to cardiovascular diseases. In addition, several vegetables and their bioactive components have been proven to protect against cardiovascular diseases in clinical trials. 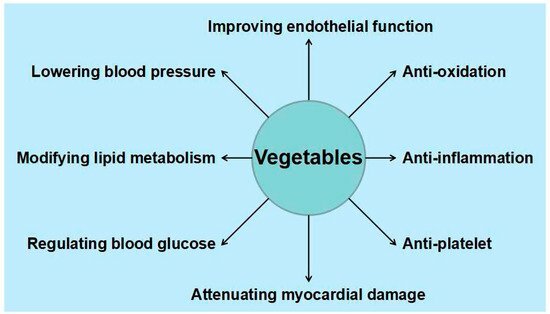 In this review, we analyze and summarize the effects of vegetables on cardiovascular diseases based on epidemiological studies, experimental research, and clinical trials, which are significant to the application of vegetables in prevention and treatment of cardiovascular diseases. Figure 1. The cardioprotective effects of vegetables. Probiotics and synbiotics are used to treat chronic diseases, principally due to their role in immune system modulation and the anti-inflammatory response. The present study reviewed the effects of probiotics and synbiotics on intestinal chronic diseases in in vitro, animal, and human studies, particularly in randomized clinical trials. The selected probiotics exhibit in vitro anti-inflammatory properties. 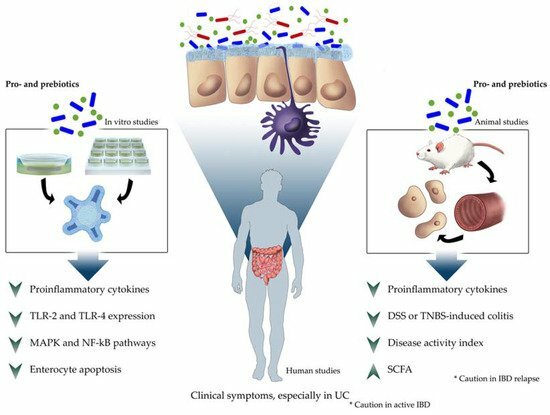 Probiotic strains and cell-free supernatants reduced the expression of pro-inflammatory cytokines via action that is principally mediated by toll-like receptors. Probiotic administration improved the clinical symptoms, histological alterations, and mucus production in most of the evaluated animal studies, but some results suggest that caution should be taken when administering these agents in the relapse stages of IBD. In addition, no effects on chronic enteropathies were reported. Probiotic supplementation appears to be potentially well tolerated, effective, and safe in patients with IBD, in both CD and UC. Indeed, probiotics such as Bifidobacterium longum 536 improved the clinical symptoms in patients with mild to moderate active UC. Although it has been proposed that probiotics can provide benefits in certain conditions, the risks and benefits should be carefully assessed before initiating any therapy in patients with IBD. For this reason, further studies are required to understand the precise mechanism by which probiotics and synbiotics affect these diseases. Figure 2. Summary of probiotic anti-inflammatory effects in intestinal chronic diseases in different scientific approaches. DSS, dextran sulfate sodium; IBD, inflammatory bowel disease; MAPK, mitogen-activated protein kinase; NF-κB, nuclear factor kappa-B; SCFA, short-chain fatty acids; TNBS, 2,4,6 trinitrobenzenesulfonic acid; TLR, toll-like receptor; UC, ulcerative colitis. A cohort of 50-year-olds from Canterbury, New Zealand (N = 404), representative of midlife adults, undertook comprehensive health and dietary assessments. Fasting plasma vitamin C concentrations (N = 369) and dietary vitamin C intake (N = 250) were determined. The mean plasma vitamin C concentration was 44.2 µmol/L (95% CI 42.4, 46.0); 62% of the cohort had inadequate plasma vitamin C concentrations (i.e., <50 µmol/L), 13% of the cohort had hypovitaminosis C (i.e., <23 µmol/L), and 2.4% had plasma vitamin C concentrations indicating deficiency (i.e., <11 µmol/L). 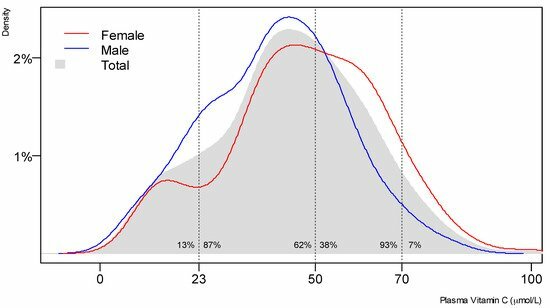 Men had a lower mean plasma vitamin C concentration than women, and a higher percentage of vitamin C inadequacy and deficiency. A higher prevalence of hypovitaminosis C and deficiency was observed in those of lower socio-economic status and in current smokers. Adults with higher vitamin C levels exhibited lower weight, BMI and waist circumference, and better measures of metabolic health, including HbA1c, insulin and triglycerides, all risk factors for type 2 diabetes. Lower levels of mild cognitive impairment were observed in those with the highest plasma vitamin C concentrations. Plasma vitamin C showed a stronger correlation with markers of metabolic health and cognitive impairment than dietary vitamin C.
Posted in Feature Highlights, MDPI News, New and Notable, Open Access Publishing and tagged cardiovascular disease, dietetics, hypovitaminosis C, intestinal diseases, nutrition, probiotics, vegetable.